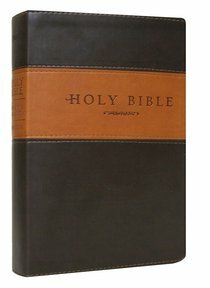 About "NLT Holy Bible Giant Print Brown/Tan (Red Letter Edition)"
The easy-to-read, giant-print New Living Translation Bible is perfect for customers preferring a larger font. It has a 14-point font size, words of Christ in red, 16 pages of full-color maps, ribbon marker, gilded page edges, and a presentation page. This edition features an attractive LeatherLike TuTone binding in brown and tan.